13 Above: World's First Underwater Museum - To Find Sunken Treasures ? World's First Underwater Museum - To Find Sunken Treasures ? 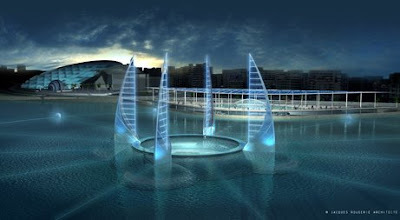 A proposed underwater museum in Alexandria, Egypt, came closer to reality in September 2008, when the UN established a committee to aid the design process with the Egyptian government. 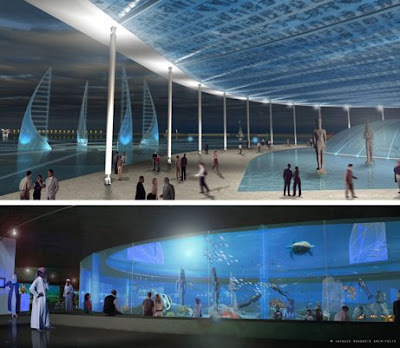 Fiberglass tunnels would connect aboveground galleries, near the New Library of Alexandria, to the underwater facility, where antiquities would be visible in their natural resting places at the site of Cleopatra's now sunken palace. A site for the museum has been proposed near the New Library of Alexandria, where the famed queen of Egypt is believed to have sheltered herself with her lover Marc Antony before taking her own life. 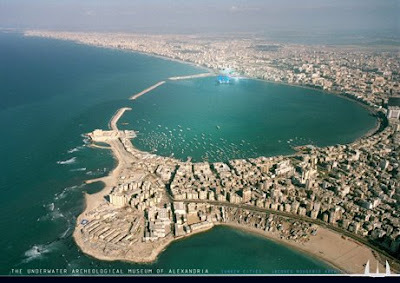 Shown with a 2008 illustration of the proposed underwater museum (upper center), the Bay of Alexandria once contained Cleopatra's island palace and the Pharos of Alexandria lighthouse, one of the seven wonders of the ancient world. Both of them were done in centuries ago by earthquakes. "It will not simply be a museum as such. It is part of a whole vision to revitalize the whole city and its heritage," said Naguib Amin, the site-management expert from Egypt's Supreme Council of Antiquities. The proposed museum's underwater facility (at bottom in an artist's conception) will be difficult and expensive to build and is the focus of the just launched two-year feasibility study. But planners believe that the benefits of plunging visitors into the historical context of the objects--on the sunken island that once held Cleopatra's palace--will be worth the trouble. "When you go to an archaeological site, you have an irreplaceable emotion. It's not like going to see a movie," said architect Jacques Rougerie. "It's like the astronaut who cannot share with other people what it is like to be in space." Twin sphinxes flank a statue of a priest of Isis amid fallen columns on Alexandria's sunken island of Antirhodos in a photo from the late 1990s. The statue was raised in 1998 and became part of a traveling exhibition. 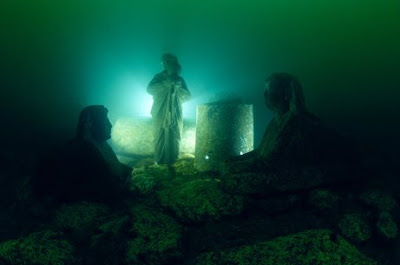 Similar tableaux remain on the sunken island, which was found by underwater archaeologists in 1996, and should be visible from the proposed underwater museum. The marble head of Roman princess Antonia Minor, mother of Emperor Claudius, rests on sand at the now sunken site of Cleopatra's Alexandria, Egypt, palace in an undated photo. Behind the head is a toppled statue of a Ptolemaic, or Greco-Egyptian, king in the guise of Hermes-Thoth, messenger of the gods. Visitors to the proposed underwater museum should be able to view these artifacts in situ. 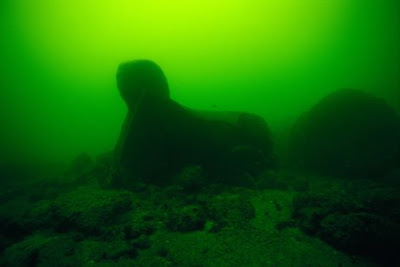 An eroded sphinx, shown in an undated photo, isn't much more than a silhouette in the Bay of Alexandria's dusky waters. The murk is driving the proposed museum's planners to propose covering the monuments, then cleaning the enclosed water. "Try to picture a glass tube," said Amin of the Egyptian antiquities agency in September 2008. "You simply put it over the main monuments that we need to highlight." 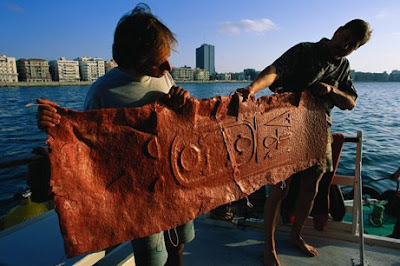 Rich with ancient Egyptian hieroglyphics, a reproduction of two granite blocks--found a third of a mile (500 meters) apart in the Bay of Alexandria--helped prove that the pieces originally formed a single tablet. "Sort of the whole ancient city of Alexandria is lying under the water, just meters away from the shore," said Amin of the Egyptian antiquities council in September 2008, when the UN established a committee to aid the museum-planning process. 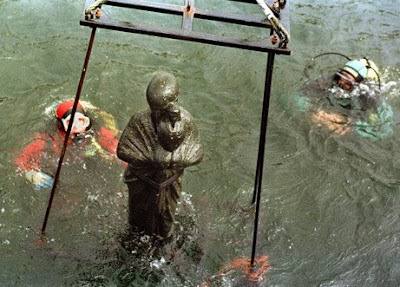 Divers raise a 4-foot-tall (1.5-meter-tall), granite, first-century A.D. statue of a priest of Isis from Alexandria, Egypt's bay in 1998. 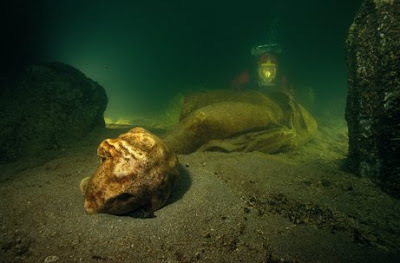 A UN convention advises that submerged artifacts should remain on the seabed as a way to respect their historical context--a view endorsed by the planners of the proposed underwater museum in Alexandria, Egypt. The proposed museum got a boost in September 2008, when the UN established a committee to aid the museum's planning. what a nice museum...I think it is the world's 1st under water museum.And it has created a history of historical moment.